Vixen is bleeding out form her injuries thanks to her battle with Kwesi. He is about to shoot her dead when she kicks the gun from his hands. He grabs her by the throat but just as soon disappears vowing “it’s not over”. Instead of killing her one of the soldiers escorts her from the village while her friend looks on. The man who saves her is incidentally the same soldier who tried to save her last issue. She walks the plains of Africa alone self reflecting until she finds water in an abandoned village. Here she is visited by her mother’s spirit who warns her to remember who she is as Jackals descend on her. She fights them off despite her wounds and their magical ailment. She almost calls for backup from the JLA but decides against it going so far as to throw away her tracker/communicator. It’s found by a monkey, her teammates realize something is wrong and plan to come to her aid. Vixen comes upon a large grassy plane where she remembers her childhood and how she wished to leave Africa. A lion comes to her attention she is too weak to fight him off and gets taken down. The lion carries her to its master who tells her she is safe. Beautiful art– Honestly the art in this series should be stripped of words and plastered across museums or walls it’s just that good. Each character has an individualized look which is something I’m becoming more and more a fan of as time moves on. Vixen is beautiful but not exaggeratedly so. Her enemies are varied and lovely to look at. Also a credit to the artist is how the art flows well adding a fluidity to the action scenes. 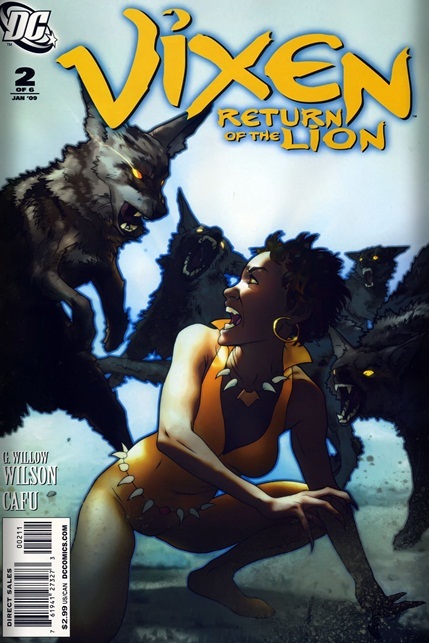 Black Hero–Vixen continues to be a strong protagonist with great motivation and inner strength which make this journey of self discovery and revenge interesting. Her need for closure by way of revenge also hold emotional resonance that most adults and teens should be able to empathize with. 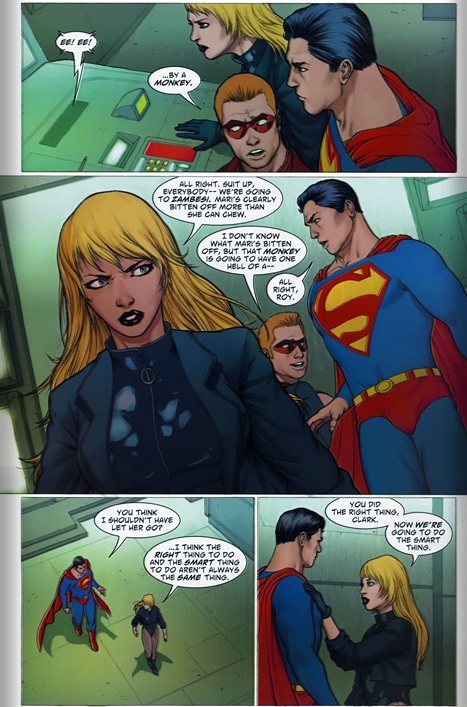 Her connection to the JLA also gets dealt with quite well without her more popular friends dominating her book. Villain-The mystery of why Kwesi left her alive when he had the upper hand is reason enough to continue reading. His abilities are also strikingly similar to her own, and bear further investigation. There was a notable lack of action this issue or at least lengthy action sequences which could leave the typical action junkie wanting. Where is Batman? Of all the JLA I expected him to be monitoring this situation and he seems remarkably ‘absent’. This was a really good story. 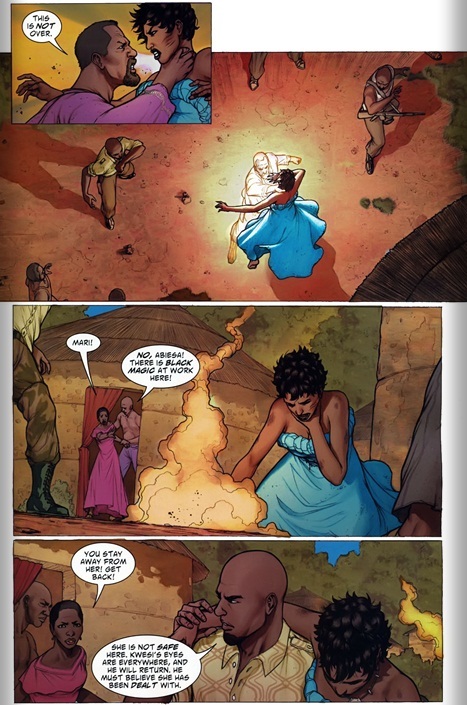 It was enjoyable to see Vixen stand on her own, overcome personal fears, and discover where her true powers are. It would be nice to see Vixen and Bronze Tiger make an appearance in Batwing; maybe even bring in Deathstroke to turn up the mix.